The wonderful Sears catalogue ads used on our Sears Roebuck feature pages are courtesy and copyright of Phil Prince. future collectors of the iridescent glassware that we call Carnival Glass. We are extremely grateful for his permission to use them. ​In the Fall 1909 Sears catalogue we saw Carnival Glass that was was essentially from the Fenton factory. In this 1910 catalogue, the sources of Carnival have widened to include Dugan and also Westmoreland. Fenton did of course feature again, and undoubtedly, the "star of the show" was their amazing Wreath of Roses punch set. 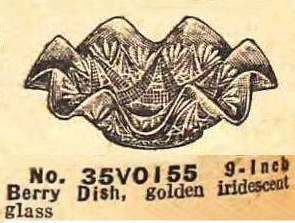 Notice how the ad refers to the pattern as "a raised design of roses and grapes". However, there are no grapes on the exterior pattern of roses, the design which gives the punch set its name today. However, the punch set is found with three different interiors (from different plungers) - plain, Vintage and Persian Medallion. Assuming the Sears description is accurate, the set on offer would have had a Vintage (a grape design) interior. ​Some Dugan lines, peach opal and enamelled decoration! Here are more items from the 1910 catalogue, showing items from the Dugan factory. As with other Dugan items shown in the catalogue (see Part Two of the Fall 1910 catalogue), one of their speciality lines - peach opal - appears as shown below, described as "Pearl edge" on 35V1294 (Stippled Petals), and "opalescent edges" on 35V5108 (Petal and Fan). It interesting to see how the Petal and Fan design is described as "Mexican bead design": at first we thought that it was referring to the edge around the top rim of the bowls, which would be white due to the opalescence. However we realised that it is describing the actual interior pattern of petals, which are heavily stippled, because the other pattern which is similarly stippled (the aptly name Stippled Petals) is also described as having "Mexican bead work in the centre". And here, below, is what they look like. ​which was described as having "hand painted lilies of the valley". The decoration was applied by hand and then fired-on to make it as permanent as possible. That so many have survived over one hundred years since they were made, with the enamelled decoration still in good condition, pays tribute to their decorating techniques and to their durability. The ad on the right is from a 1910 Butler Brothers wholesale catalogue and it shows a range of enamelled Carnival Glass in peach opal. Dugan used a variety of bowls with moulded patterns like the ones shown in the ad - left to right: Single Flower, Stippled Petals, and (Dugan) Cherries. 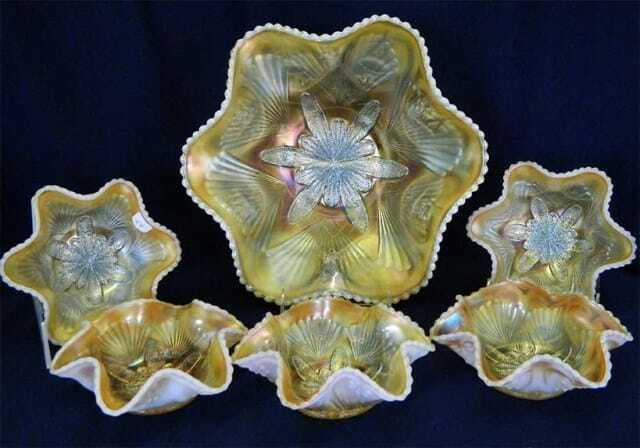 ​There are several different floral designs which seem to be interchangeable from one bowl to another. Lily of the Valley and Forget-Me-Not were popular. For even more variety in their offerings, the bowls were shaped differently and different edge treatments were applied! Here we see two Stippled Petals pieces, which are shaped differently and with different floral decorations: below is a Lily of the Valley decoration on a deeply ruffled bowl (courtesy of Seeck Auctions) and on the right, a Forget-Me-Not decoration on a completely round, dome-footed plate. Such versatility! Click here to for more revelations from Sears Fall 1910 catalogue in Part 2! See more Sears catalogues on the Sears Catalogues Homepage.